There's been a lot of buzz around crystals over the past year or two, and I can totally see why. They are pretty, fun to collect, and don't cost an arm and a leg to get started with. You can pick up whatever speaks to you little bits at a time to slowly build your collection with the promise to find increased clarity, health, and wellness in their use. I was very curious myself - wondering if I could really use a pretty gem to ease pains and keep me happy and grounded. I had no idea how or how well they worked, but it was easy to pick a bunch that sounded promising to give it all a shot. Since then, I've collected many pretty crystals, and I've gotten a lot of questions about where to shop, what the best crystals are, and how I personally use them. So to make it simple...I'm going to break it down FAQ style! If you've been thinking about getting started with crystals read on - and leave me any questions I may have missed in the comments!! Where do you shop for your crystals? Depending where you live, there may be some small local shops nearby, or even vendors at craft shows and things like that. Personally, I like to buy mine from Hollie Stark (she's online, so that's an option no matter where you are!) and Spiritually Rooted (which is a small spiritual shop in my area). I did write ups on both of them in recent months, so be sure to click on those posts for more details! What's a good first crystal to try out? I think any kind of quartz is great because they are pretty and well-energized. I always recommend a Clear Quartz Point for really feeling the energy of a crystal because those can feel like you're holding a battery after you've held onto them for a while!! It's a great way to actually notice what that crystal energy feels like. Rose Quartz is also great, because it focuses on self-love and self-worth and I feel like if we have those things in life, we can be great at everything else! 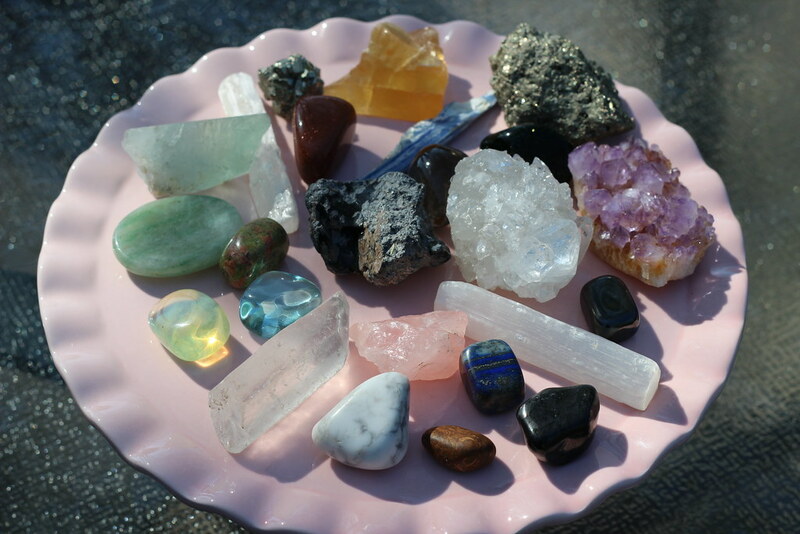 I'd also throw Selenite in there as an option - its cleansing, never looses its charge, is good to have near other crystals, and is especially pretty when polished. Should I get raw or tumbled crystals? It's totally up to you, and I have a collection of both personally, but I prefer raw crystals. I just sense a stronger, more raw energy in them. However, if you need calming or soothing, the soft energy of a beautiful polished crystal or gem might be perfect for you. So don't avoid purchasing one or the other - always pick what calls to you! There are SO many crystals out there - how do you decide?! My best advice is to take home anything that catches your eye - especially if you keep getting drawn back to it. 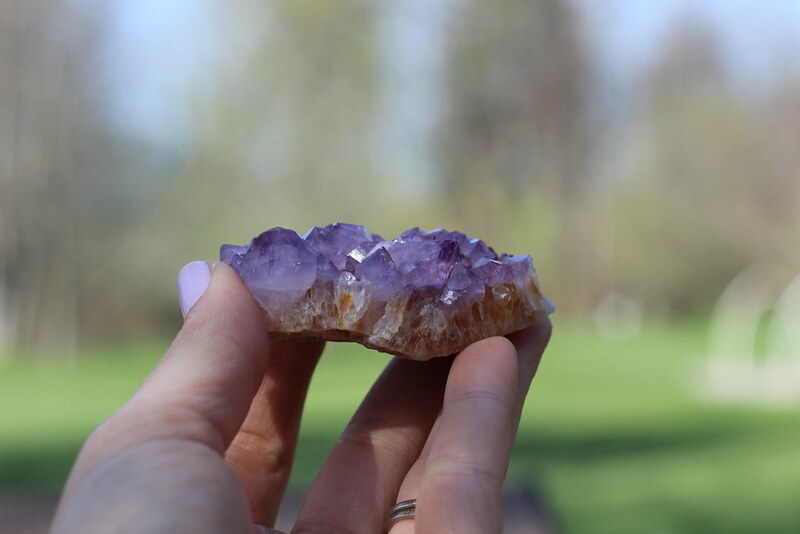 This is my favorite experience at Spiritually Rooted, because there are SO many crystals to be seen there (or in any crystal shop), but I tend to be drawn back to the same few over and over. And each time I go, it changes a little. The energy of the crystals call to your energy (either because they are an energetic match, or because they are what you need to shift your energy into a more positive place). Pick what YOU like, and you can look up their uses and meanings later. My favorite ways to use them are in meditation and yoga. I just place them in my hands and let them rest there during meditation or savasana, and during a yoga class or practice I put them along my yoga mat to surround me until I'm ready to hold them. Sometimes I hold them while I sleep to enhance my dreams (which are already pretty wild, and it's a story for another day, but I'm a somewhat psychic dreamer), and I'll also arrange them near me for different things. I'll set out bluish and white crystals when I write, for example, to enhance communication and clarity. If I'm feeling anxious, I'll rub a worry stone or set Howlite on my chest while I practice yogic breathing. I'll rest them on my forehead if I have a headache. There are SO many uses! You can even make energy infused water by dropping tumbled (and cleaned!) crystals into your water. How do crystals work, anyway? I am not an expert, but this is my personal understanding of them. As with everything on earth, crystals contain energy. Their energy is a pure, earthly energy that's taken directly from the natural place where they were harvested. Therefore, we can utilize them to help us adjust our own energy or vibration. The speed of the vibration a thing has (in all of matter) determines its details, including color. 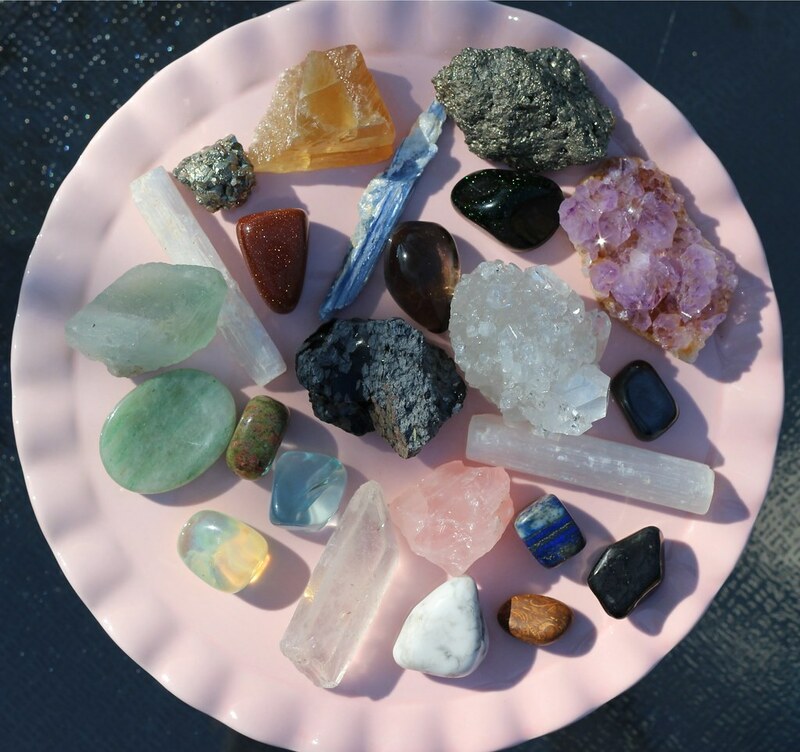 So different shapes and colors of crystals carry a different vibration of energy, making each one carry its unique uses. Crystals are known to align with the colors of our main chakras (like blue crystals for our blue throat chakras to aid in communication, for example) because the vibration of our energy slows down as it moves from the crown of our head, through the chakra system in the body. Our crown chakra at the top of our head is violet (and purple tones have a very fast vibration), and our root chakra at our tailbone is red (and red tones have a much slower vibration) - the same is true for those colored crystals. Make sense? How do you store your crystals? 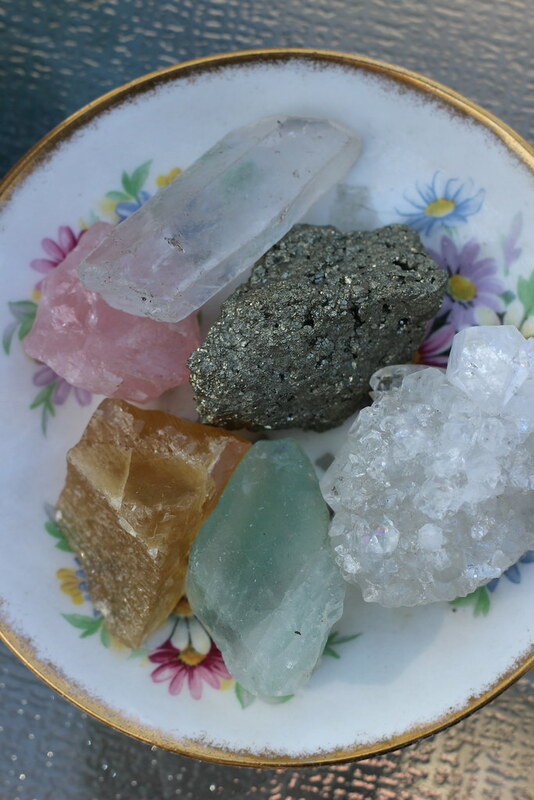 I keep mine on a pretty little vintage tea plate, surround by Selenite to keep them nice and cleansed and charged. Store them anyway that makes you happy! Do you charge your crystals? Eh. Like I said, I always keep Selenite nearby, and if I've taken my crystals on vacation or I've used them a ton for dealing with negative energy, I'll sage them to make sure nothing negative was left behind. But I don't worry about it too much - crystal experts are now saying that it's not completely necessary. It's always changing! Depending on what's going on in my life or what I need at the moment, I'm drawn to certain crystals more than others. 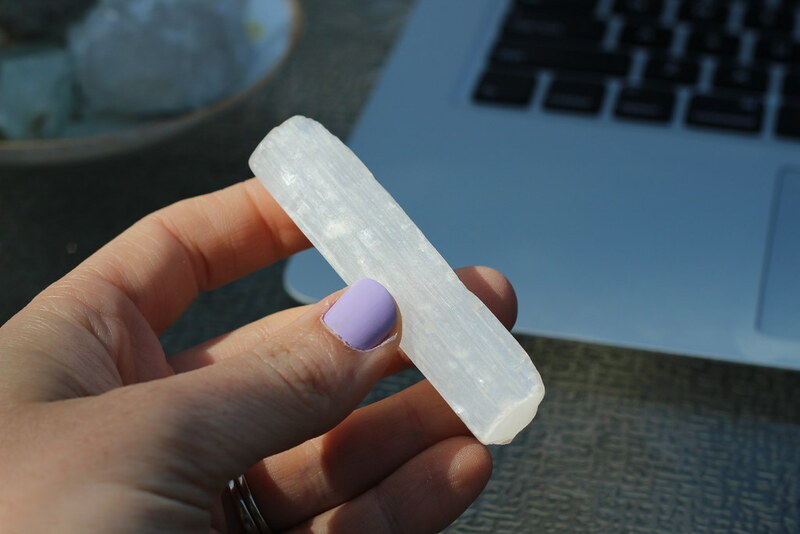 However, Selenite is a staple for me - there's just something about it. If you're shopping in a crystal shop, they'll often have descriptions and uses listed for each type of crystal. Snap photos of these on your phone so you can refer back to them later! Okay, just checking, but...is using crystals sacrilegious? Uhh, nope. Sometimes the argument is made that they can become an "idol" that detracts from a belief in God, but hello - Catholics have rosaries and all sorts of symbolic religious tools. You can read all about my personal beliefs here if you're interested, but my personal take is this - did God make the earth? Yep. Do crystals come from the earth? Yep. Were humans intended to use all the earth has to offer to live their lives? Yep. Are there not medicinal herbs and plants on this earth? Yep. So why is a crystal, harnessed from the earth not the same thing? One can even argue that since they are made from the earth, which was made from God, that the energy within them is a little sparkly piece of God Himself. LOVE your last comments about sparkly piece of God. So true that the earth has many natural and beautiful treasures that we would be foolish not to consider at least if not utilize.